The US macro data put USD under pressure while EUR was empowered by German Retail Sales. The support rests at 1.16350 with resistance at 1.17770 which the weekly pivot point at 1.17080 is located in between the lines. The EMA of 10 is moving with bullish bias in the ascendant channel and it is below the EMA of 200 and the EMA of 100. The RSI is moving in overbought area, the Stochastic is moving in high ranges and the MACD line is above the signal line in the positive territory. The ADX is showing weak buy signal. 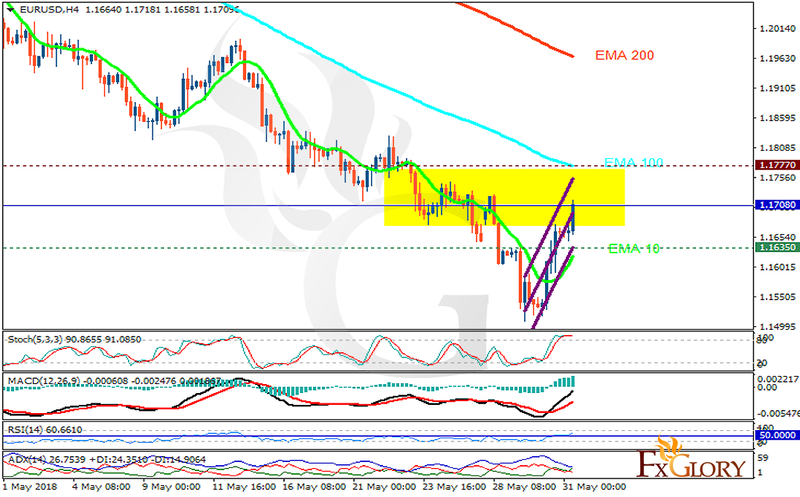 The EURUSD pair may continue its bullish trend towards the resistance area, however, it will eventually fall again towards 1.15.